This LeBurn house is the second station to sit on this location over the years. The first house was opened on January 28, 1854 for Americus Engine 6. This company was known as Big Six or Tiger. One of the Foremen in this company was the famous William "Boss" Tweed who was the political boss of New York City during the 1850`s through 1871. He was arrested for corruption and died later in prison. The first house was located at 23 Gouverneur Street. The new house on Henry Street was the first known house to have sleeping quarters for the members and was the grandest of all the houses in the City at the time. Engine 15 of the piad department replaced Engine 6 on September 18, 1865 in this building. Engine 15 moved to 180 Clinton Street on November 15, 1883 and the old house was torn down for the new building. To make room for Engine 15 in Clinton Street, the second section of Ladder 6 was taken out of service. Engine 15 moved into its new home on June 1, 1884 making this the fifth oldest active house in New York City. Engine 9 relocated here from 55 East Broadway on January 10, 1966, while Ladder 6 moved into Engine 9`s former quarters. Once the new house on Canal Street was built Engine 9 moved in with Laqdder 6 on May 6, 1969. Squad 5 shared the house from May 15 1969, untill January 10, 1970, and then moved to 185 Broom Street. 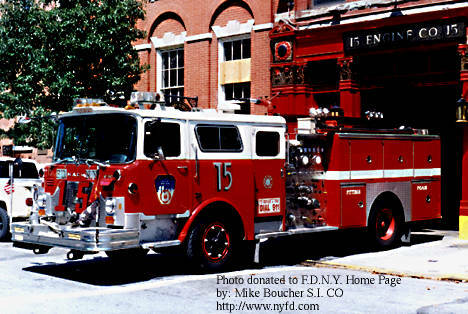 During the financial crisis of 1975, Engine 15 was disbanded on July 2, 1975 and placed back in service on July 19th. FF. Christian L. Walter was injured on March 13, 1917, and died on Mar. 17, 1917. FF. Stephen J. Flinn died while responding to 263 Stanton St., Nov. 18,1920, Box  248. FF. Peter J. Dannhardt died in a plain crash in California, U.S. Navy, July 4, 1943. Gouverneur Sts. Dec.30 1946 Box 66-239. FF. Samuel R. Doherty died on Nov 28, 1949 after being injured on Nov. 7, 1949,   Box 245. FF. Ambrose L. Austin, James Gordon Bennett Medal, Apr.24, 1871. Lt. Michael J. Martin, Brooklyn Eagle Medal Nov. 26, 1906. Engineer William McAllister, Strong Medal, Jun.14, 1913. FF. Timothy F. O`Leary, Jr., Crimmins Medal, Apr.6, 1914. FF. Timothy F. O`Leary, Jr., James Gordon Bennett Medal, Sept.1, 1919. FF Kurt Fuchel, Trevor- Warren Medal, Oct.19 1919. Lt. Edward D. Kelsey, Crimmins Medal, May 3, 1952.